Sandals Grande Antigua Resort and Spa saw over fifty of its team members receiving certificates during a special ceremony last week. 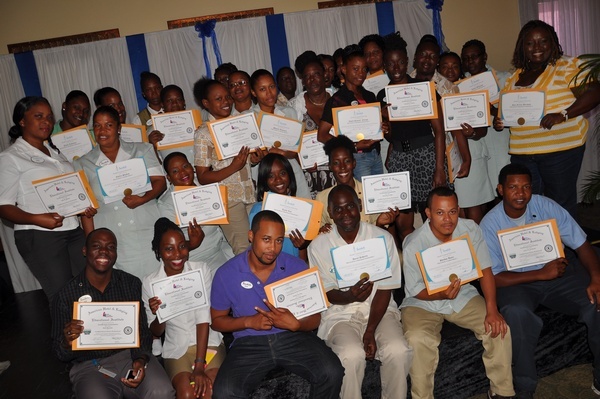 The large group consisted of both management and staff who completed internal courses such as customer service, leadership, the art of selling and professional communications under the Sandals Corporate University (SCU). Speaking at the certificate ceremony was Regional Training and HR Manager Ryan Matthew, who congratulated the team members on their latest achievement. “By taking this path to success, you’ve understood that learning doesn’t just happen; it must be a conscious activity and that all jobs, no matter how routine, offer learning opportunities. You are ready! You are prepared! Remember that with every new day you will always reach for greatness. Rise and shine!” General Manager Gaurav “Mr. G” Sindhi also showered the group with praise, stating that “In my four years of working with Sandals, this is the largest group I have ever seen and for that you should all be proud of yourselves in knowing that you are setting a high mark in the Sandals chain”. Training Manager, Sherene Bird explained that SCU was launched in March 2012. “SCU represents Sandals Resorts’ commitment to the professional development of our employees through reputable education and training programs. Every staff member is invited to apply and experience courses that they are interested in to further advance their career and broaden their knowledge”, Bird added. Since its inception, over 1,200 team members have registered with SCU, with close to 1,000 certificates issued. They now have access to more than 230 courses and external partnerships with 13 top-ranking local and international universities, with plans for even more expansion this year. Through this unique and invaluable program, Sandals Resorts hopes to make a meaningful impact on visitors’ experience by guaranteeing the best customer service, attitude, skills and knowledge from every team member they come across.